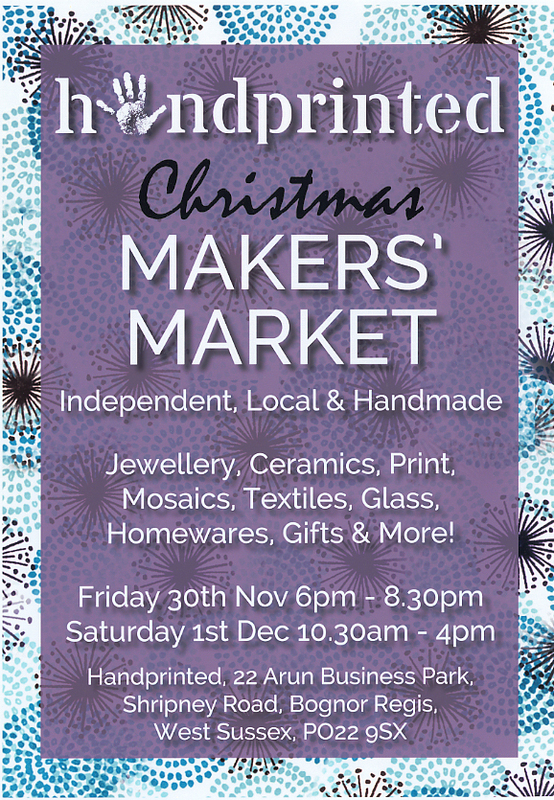 A great market bringing together a diverse selection of makers from the area. Or their Facebook and Instagram pages for daily updates on current news and who is going to be exhibiting. Me too btw! 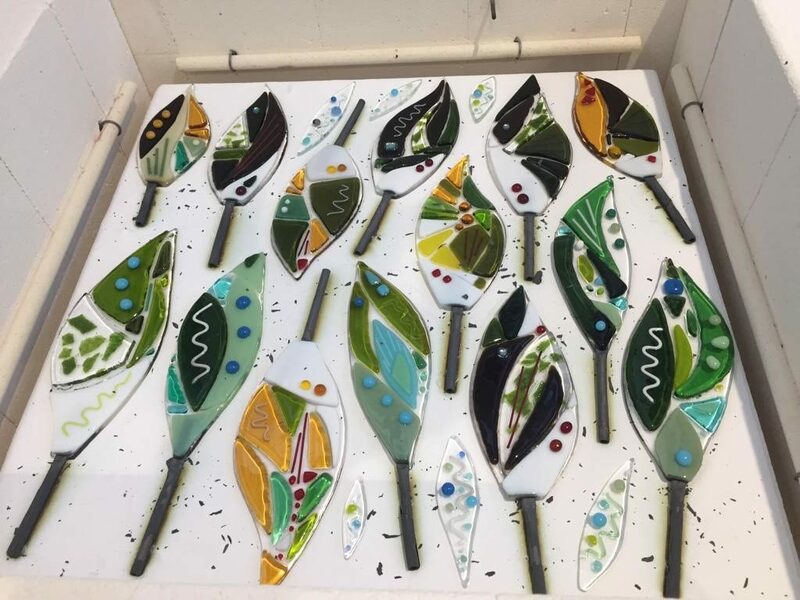 More to follow – but got to get this lot out of Anne’s kiln first! 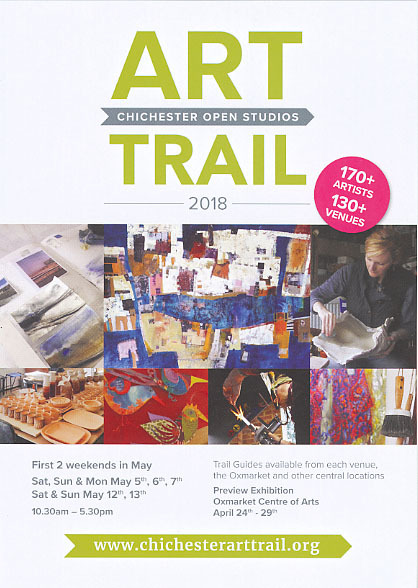 Those of you who have read the guide, will know that I have arranged some mini 30 minute workshops to run alongside the Art Trail. There will still be examples of the stages involved on display, but sadly I cannot take on any more supervised hands-on activities. You will be of course very welcome to visit, and there will be plenty else to see. 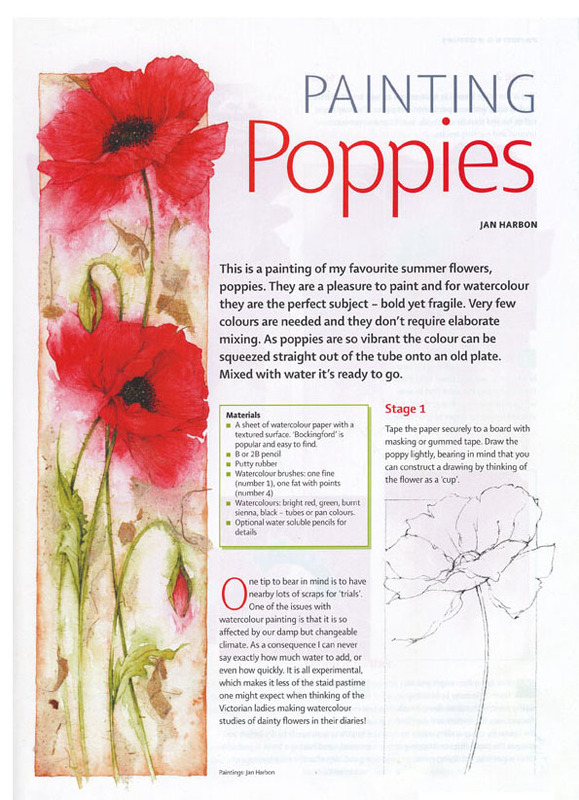 I have below a magazine article showing how to go about painting a watercolour poppy with a wet-in-wet technique – hope it’s of interest. What follows is much more of a “tutorial” than a “demo”, so I have been as detailed as I can be (without actually being at your side!). 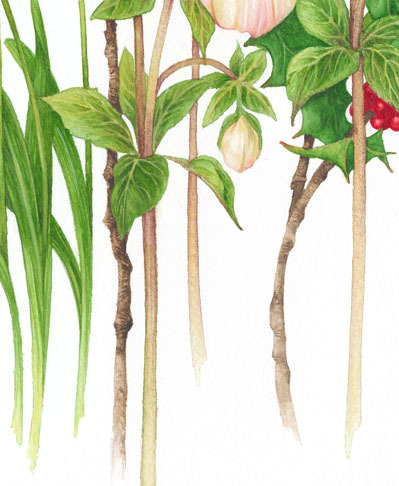 I would not call this a botanical painting myself, but maybe a halfway house to it. If you just want to see it just as a “demo”, just skip the text! I worked out the composition carefully, firstly by making small thumbnail sketches, and then by completing a finished drawing. 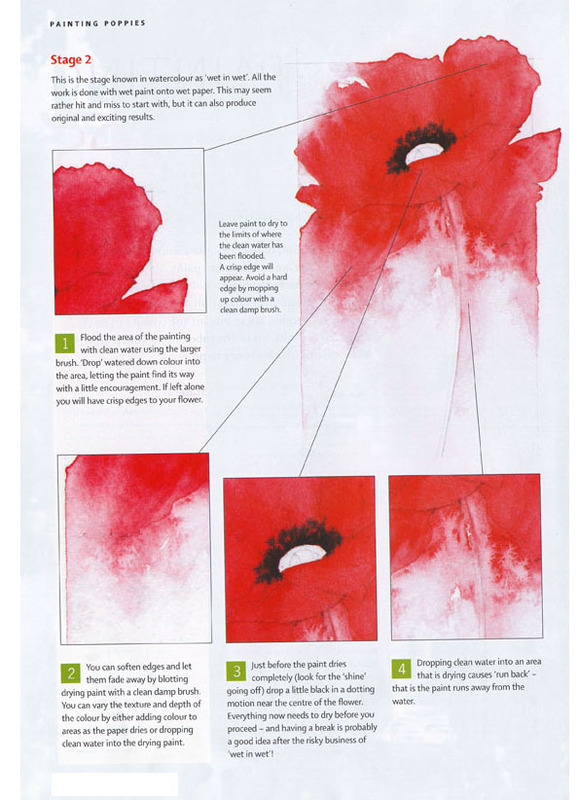 If you would like to follow the step by step instructions and make a similar painting, you could find this a helpful starting point. 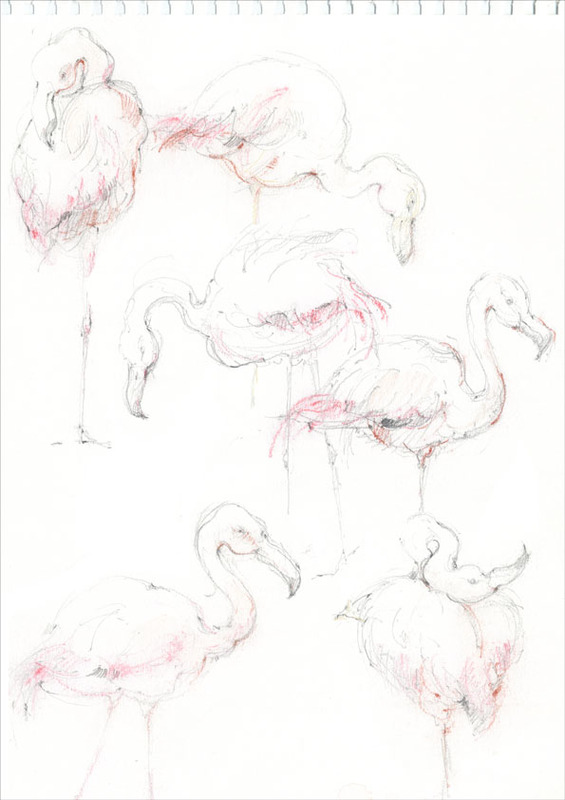 You might even take this further, by taking a scan of your pencil drawing and lightly colouring it in. I have found out the hard way that mistakes are more easily rectified nearer the start than the end! 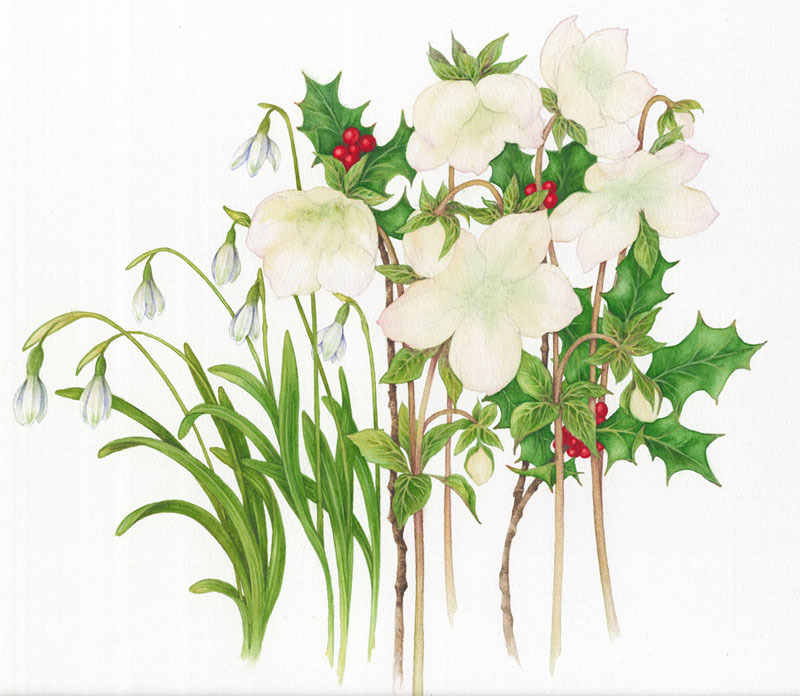 It would have been easy in this painting to “lose” the hellebores and snowdrops against the white of the background, so I have used the leaves to accentuate them. The focal point, or central area of the painting, is framed by attention seeking red berries. 1. 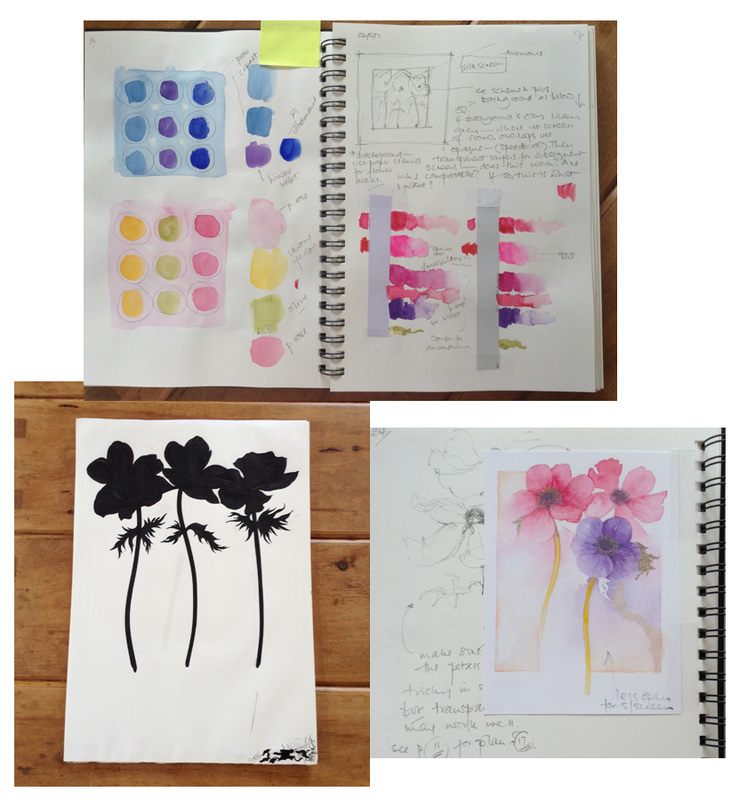 Having decided on your composition, you can transfer it lightly onto your watercolour paper. Do this by either drawing directly, or using tracing paper and a non-greasy carbon paper made for this purpose. 2. Unlike most paintings where your first attention would be paid to the flowers (partly because they fade more quickly), it would be better to start with the foliage. 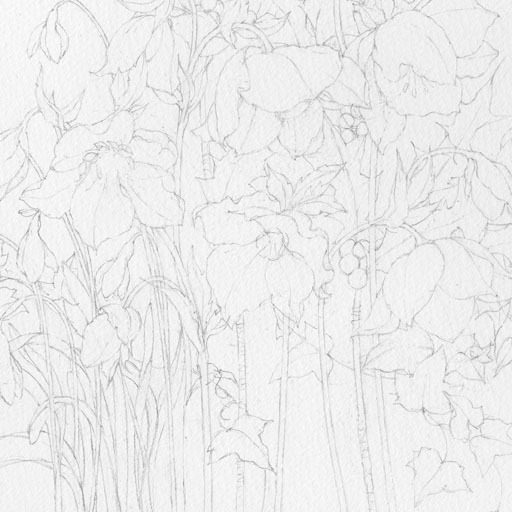 This is to avoid the temptation of putting too much colour onto the flowers too soon. 3. Fig. b. 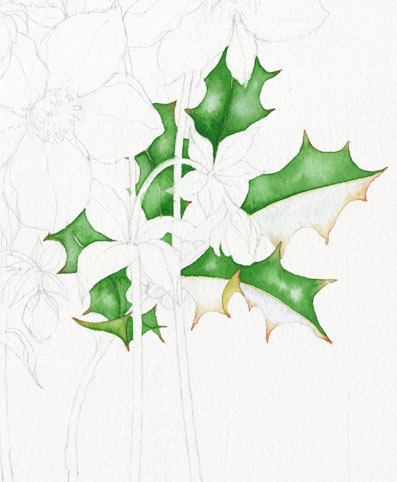 Starting with the holly, paint in centre veins with Winsor Yellow, and when dry, flood half the leaf with clean water. Into this drop a dilute amount of French Ultramarine. While damp (but not soaking wet), touch the points and edges with a tiny amount of Burnt Sienna. This should merge, but not move far. 5. Fig. 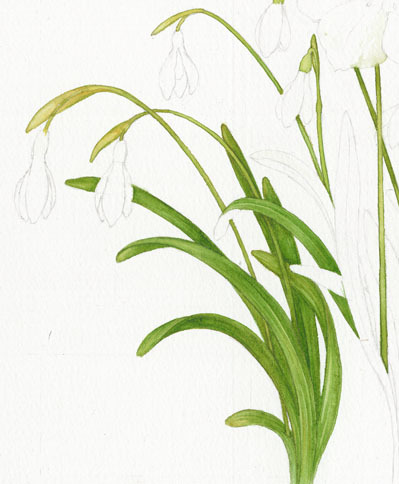 d. The snowdrop leaves and stems are a mixture of Sap Green and Winsor Yellow, more yellow being added to the stems. Each leaf has central vein slightly more yellow than the rest. At this stage don’t worry about more detail and secondary veins, the main thing is to be building the painting as a whole. 6. Fig.e. The hellebore leaves are young, so a fresh Olive Green with yellow veining is appropriate. Half a leaf at a time will still be a good method, and the addition of a little burnt sienna at the leaf base will help “join” them to the stems. 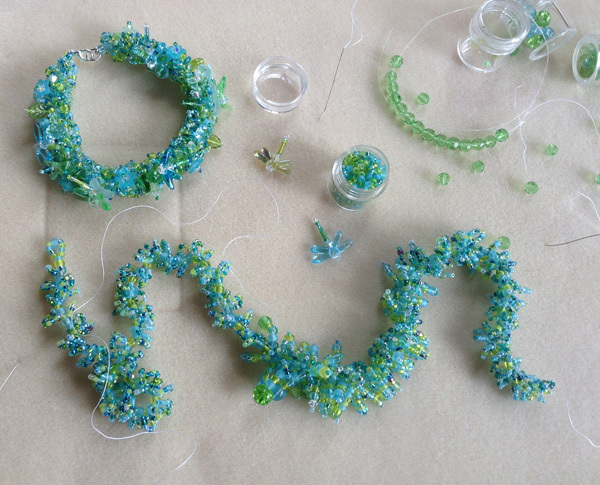 The stems are started with a base of clean water into which Olive Green is stroked. 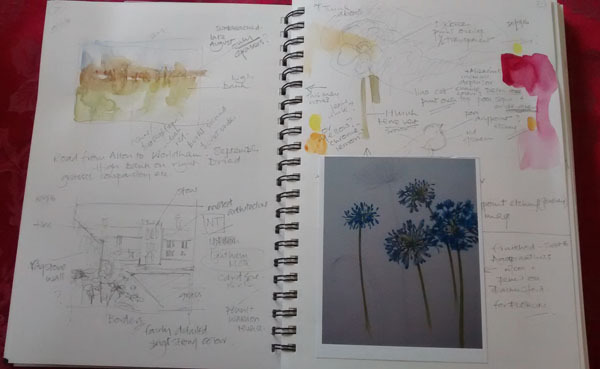 While still damp, add very dilute Burnt Sienna, increasing the amount nearer the flower. *TIP Don’t try to do too many leaves at once because you have spare paint on your brush. They are bound to catch you out and dry more quickly than you can cope with. 7. Fig.f. 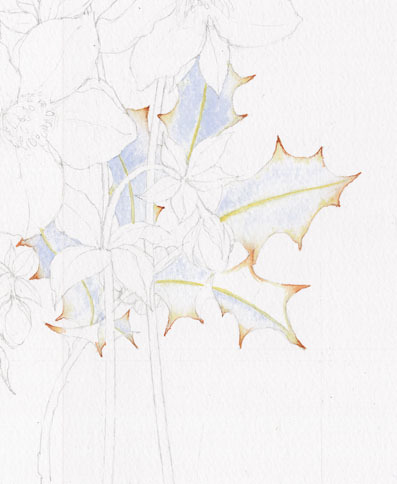 Begin the stems of the holly with a weak wash of Burnt Umber. When nearly dry, add more pigment in the form of cris-crossing the stems in an irregular way to indicate their woody nature. 8. Fig.g. You can now see that the flowers are being pushed forward into the spotlight, and even the snowdrops, slightly isolated, have some visual clues to their shape where a couple deliberately cross in front of stems and leaves. Apply a wash of clean water and add very dilute Permanent Rose, followed by Olive Green nearer the centres. Ignore the majority of the stamens and anthers etc., these can be painted later by using gouache. 10. Fig g,h. By using a clean damp brush, “lift” out the secondary veins in all the leaves. By dampening the line and then blotting with kitchen paper, you can achieve subtle veining. Where more positive veins are required, paint over with the yellow, trailing out towards the edge of the leaf. 11. Fig.g,h. The snowdrops are very white, and it’s always a challenge avoiding the “concrete look”. Try not to use grey, instead, think of all the things that happen to white on a sunny Winter’s day. Reflections of the bright green of growth and the blue skies. So, shape the snowdrops with a little of both colours, and hopefully a more pleasing result will emerge. Very dark areas can be expressed with a tiny amount of Burnt Sienna added to the blue. 12. Fig.h It is best to deal with alternating berries. Otherwise they all tend to merge into one big blob. Apply a clean wash of water to a berry and drop Winsor Red into it. As it dries, add a little Alizarin Crimson around the circumference, forming a sphere. When dry, “lift” out an area of highlight, and when that’s dry, do it again firmly in a “dot ”. Remember to have all the highlights facing the same direction. 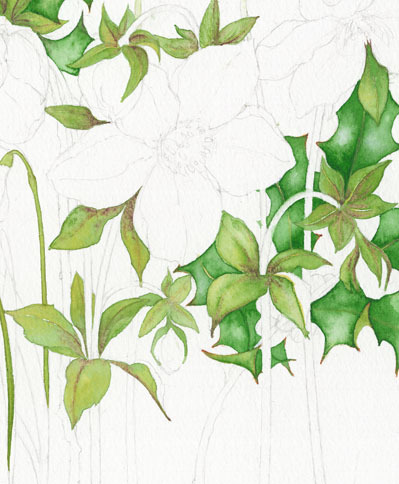 *TIP Whether painting leaves or petals, never paint across, but always follow the direction of the growth. 8. Fig.h. 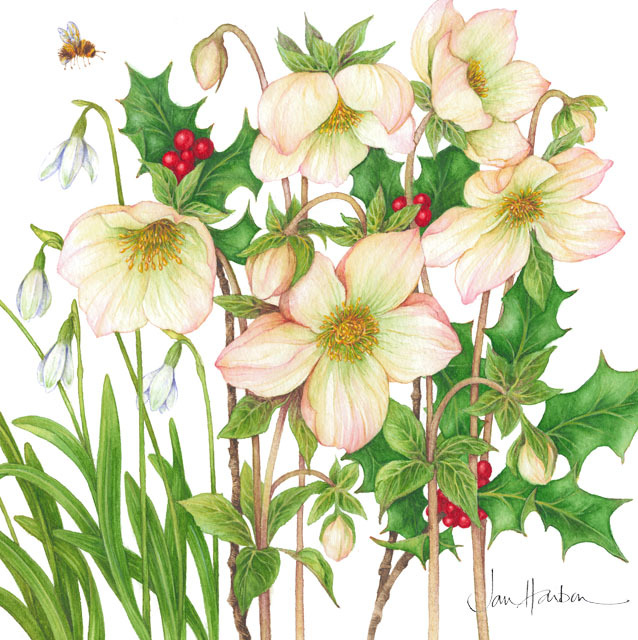 When the hellebore flowers are dry, lightly apply more Permanent Rose in the folds (always following a vein), some Winsor Yellow and some Olive Green. Soften the hard edges of colour with a damp brush. Repeat this again without necessarily softening, making sure there are some distinctions between the petals and the upper and lower surfaces. 9. Fig.h. 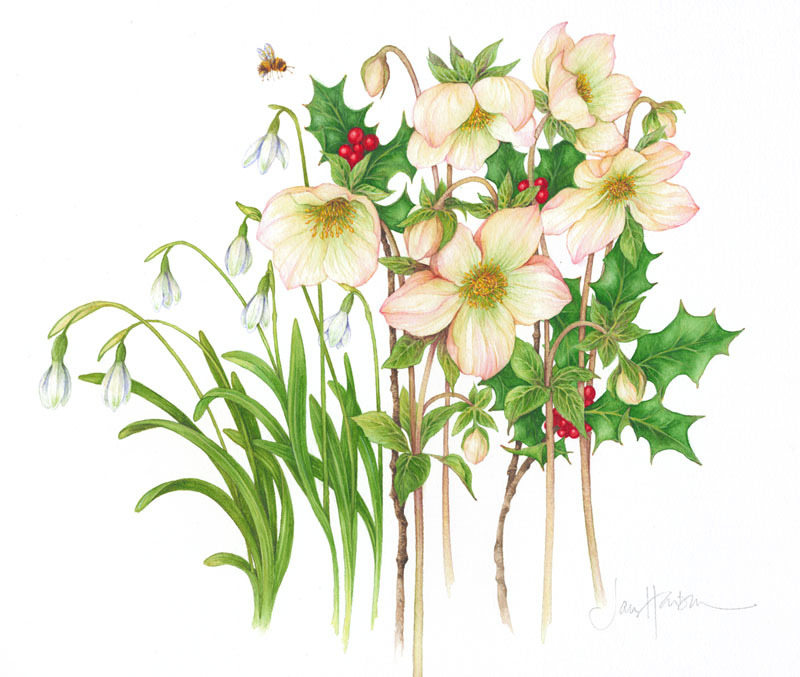 With white gouache and using a fine brush, paint in all the centres of the hellebores, stamens, anthers, etc. When this is dry, colour with Winsor Yellow, using Burnt Sienna for shadows and outlines. 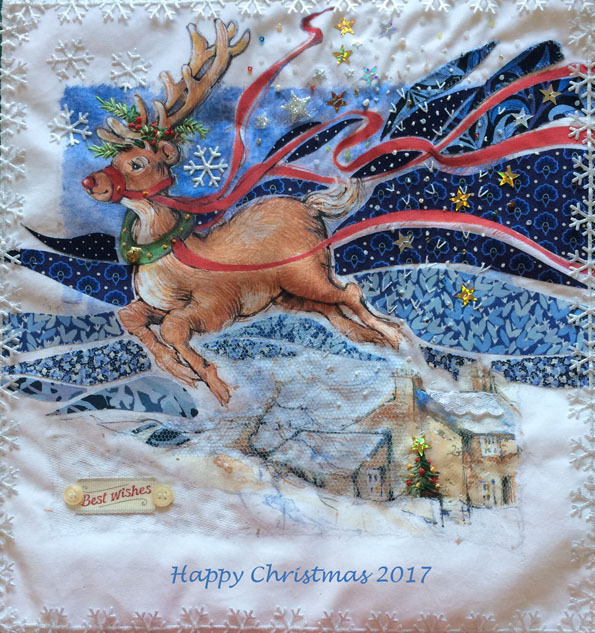 This painting was originally commissioned as the NAFAS Christmas card some years ago. 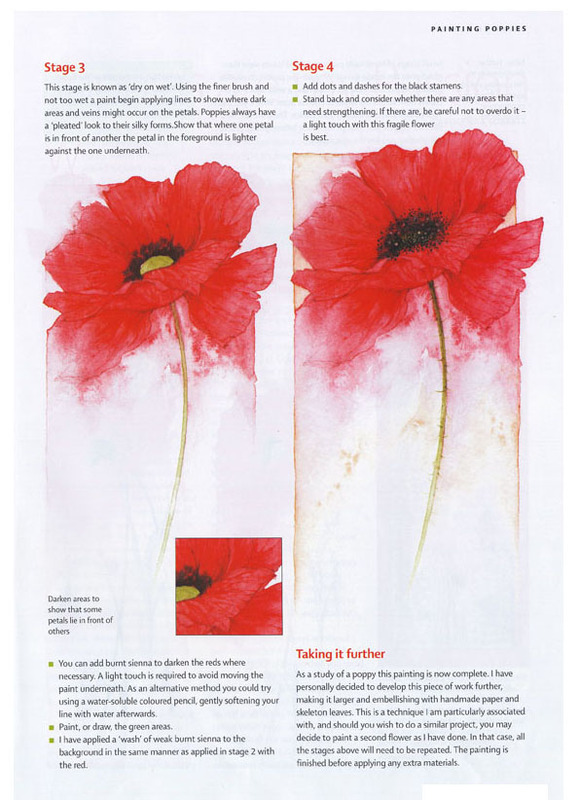 A step by step tutorial of it was published in the Flower Arranger Magazine. 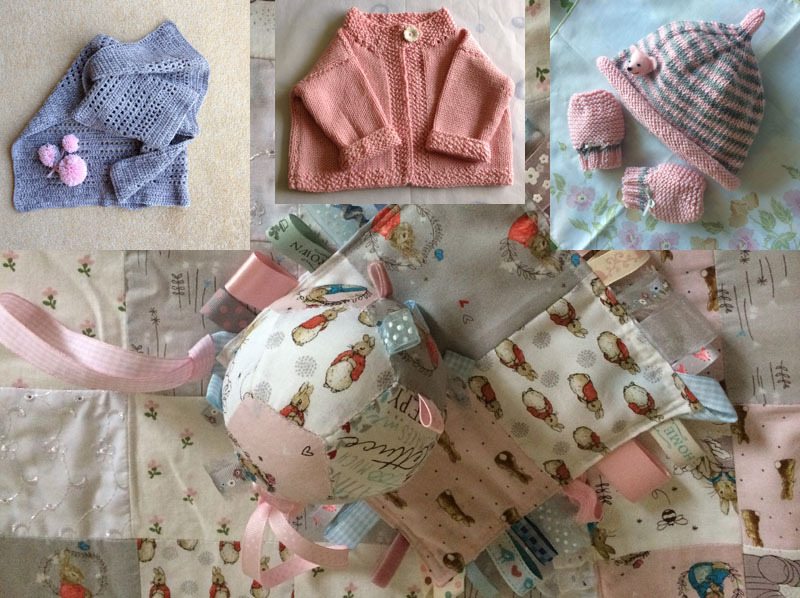 Welcome to the handmade world Tabitha! I’m not a great knitter (grandson will testify that I can’t manage to get sleeves quite right), but I’ve enjoyed making little articles for our new granddaughter. They don’t take so long to do when they are new born – might have to wait longer for results as she grows! I have been doing other things this Autumn, below is a quick montage of things I’ve been occupied with – and we’ve had a lovely couple of breaks in Devon and Madeira. 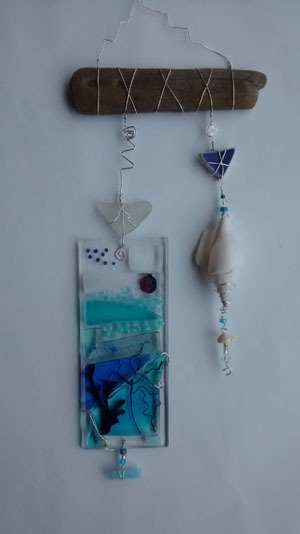 I’m hoping to get back now to some glass fusing, painting and printing. Oh, and some sewing too. Oh, and another mosaic….. I have embarked on an advent calendar for Instagram, loading an image per day. 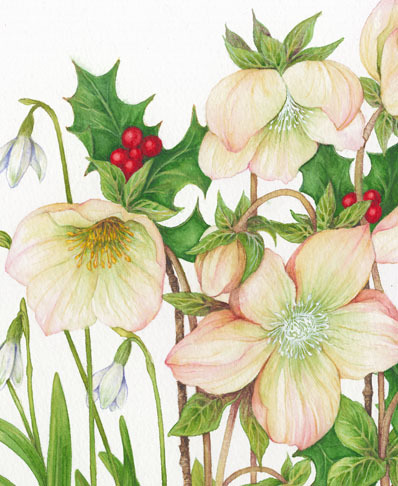 I have promised a tutorial on my blog of a Hellebores and Snowdrops painting this weekend. It’s all prepared, so I hope it will be on this website by tomorrow evening. Fingers crossed I can cope with the tecchy aspect of it. Trust you enjoy reading it, and the rest of the daily images on Instagram yet to come. Join me tomorrow! Been quiet on the blog front – trying to sort out a variety of questions I had on the technical aspects of what is supposed to be a simple little blog – oh what a difference a few dots and dashes make……. hopefully sorted now. 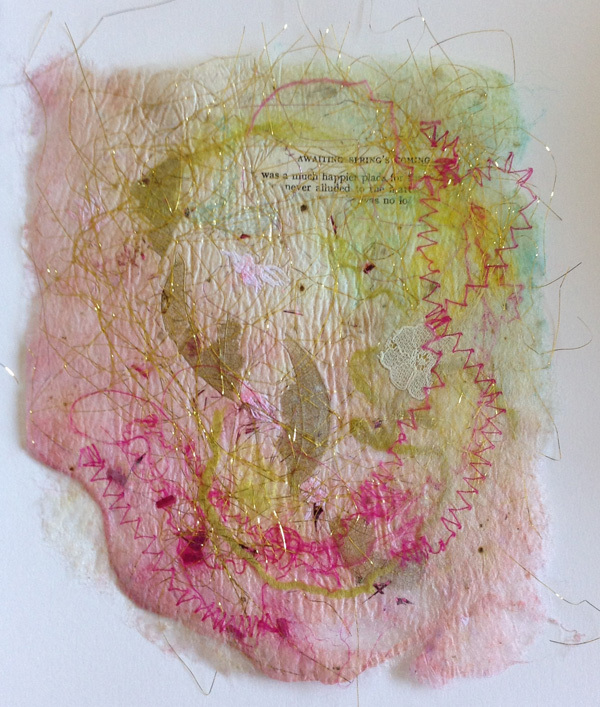 Whilst that’s been rumbling on in the background I’ve been escaping into the happy world of print, dye and sew. A lovely day thermofax screen printing with Handprinted in Bognor Regis. using an “old school” thermofax printer and the magical transfer screen. 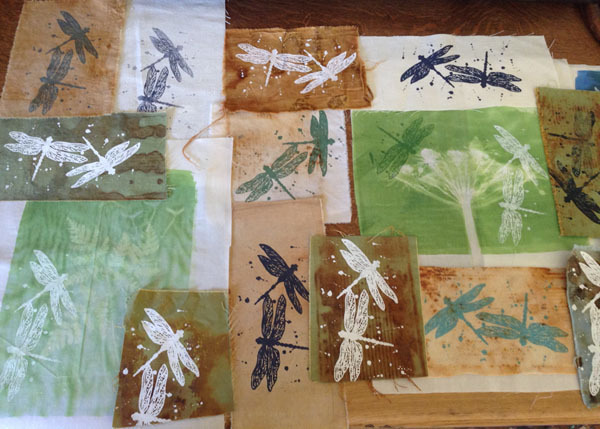 Not quite as versatile as conventional screenprinting, but SO much simpler for a quick result! 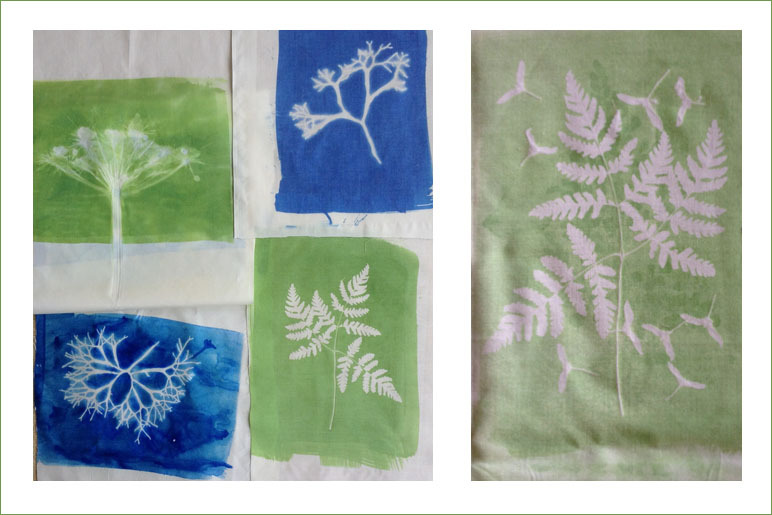 Another eye-opening experience with Handprinted at one of their “Fab Fridays” workshops taught me how to print with my (many) pressings of seaweed and ferns – I knew there’d be a use for them! 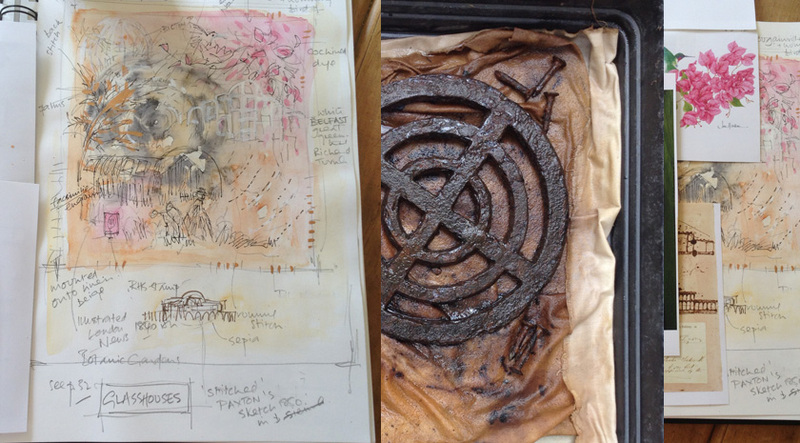 And then…..a great day with Jule Mallett, learning about the messy and smelly process of rust dyeing. 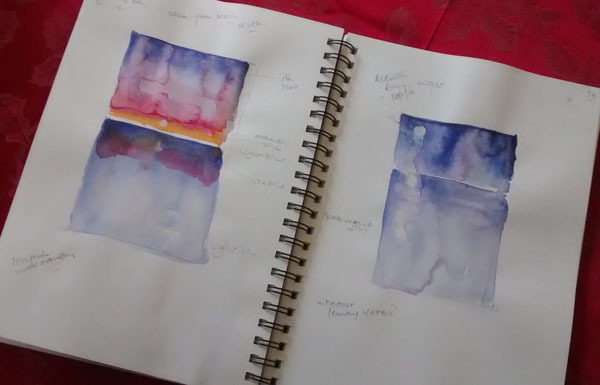 Such lovely and unexpected results made by combining iron objects with either vinegar, tea, water, salt water (I do live beside the sea – knew that would be useful too! ), and any number of other combinations, wrapping in fabric, laying on paper, leaving to the elements, putting in plastic bags, so and so on! Jule was an enthusiastic mine of information and ideas. Soooo…thought I’d combine some of it all together…. 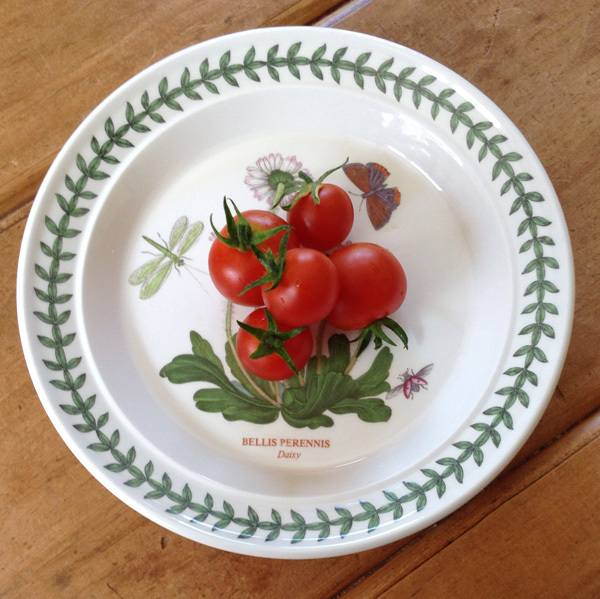 I am just going out to the greenhouse now (surely you didn’t think it was just for tomatoes? ), and I’m going to put a rusty old Victorian drain cover – purloined from Tom (Harbon Builders) onto a piece of silk noile and cover with sea water and tea in a deep tray. Then leave. We’ll see what happens. I really hope to avoid vinegar – the smell at the workshop was almost overwhelming! 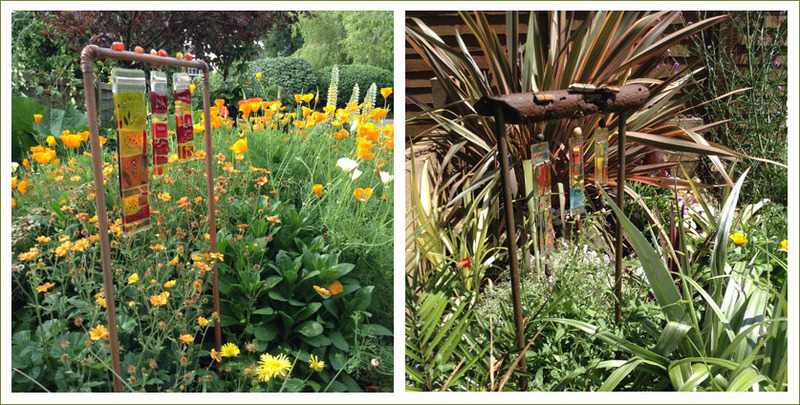 With the help of Geoff and some copper tubing, I’ve put a couple of fused glass installations into “hot” areas of the garden. The colours look beautiful with the sun shining through them. I wish I could find some more rusty tubing on the beach, it made a good contrast with the smooth textures of the glass. (Not that I want to encourage throwing old car parts over the harbour wall in ANY way – I’ll do that “rusting” in the greenhouse too if necessary). Ah yes, the sewing….it’s coming on….more next time. 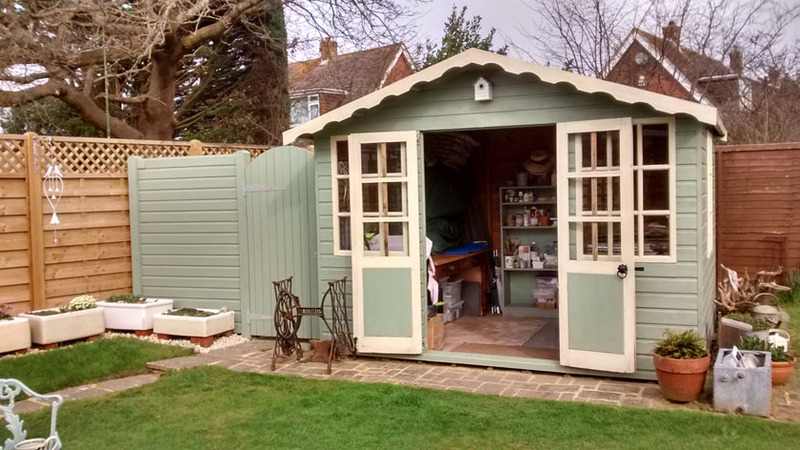 Time to get the shed ready – it’s warm enough to take the glass cutting and painting equipment down to the bottom of the garden and install myself there until Autumn. It’s probably a bit safer to cut the glass down there than on the dining room table. (due to my inexperience the direction the offcuts tend to go is a bit erratic!). It’s lovely and peaceful too. Not the largest space, but that’s fine. There’s room for my old desk and another of similar size. And LOTS of plastic boxes. Handprinted, the brilliant studio and print suppliers down the road, hire “open studio” space, so that’s the printing facility sorted. Booking means I don’t just mess about thinking and not doing- I need to get stuff prepared for the day I’m there. 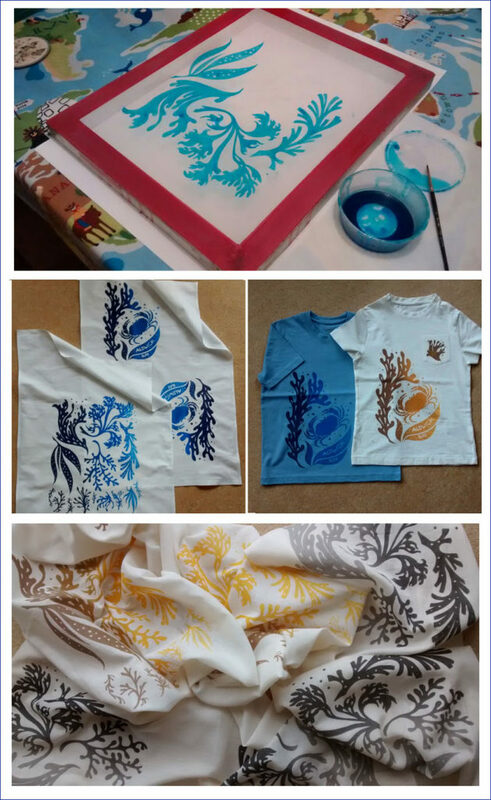 I’ve been yet again on the seaweed designs – this time t-shirts, T-towels and long, long scarves in both silk and muslin. Printed a few motifs onto scraps for use in patchwork later too. 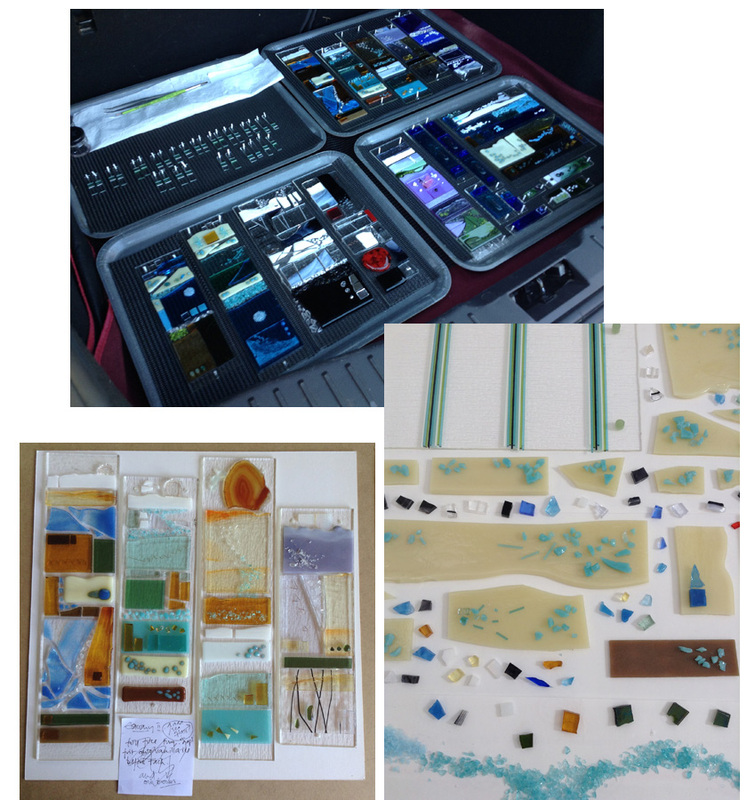 Think I might clean the screens now and dream up something else- I was getting a bit obsessed with the stuff……still need to do some proper paintings yet though…..
Once it becomes layered, glass seems very tricky to photograph. The edges look as if I’ve moved the camera, but it’s just shadows. Well, you get the gist of it I hope. 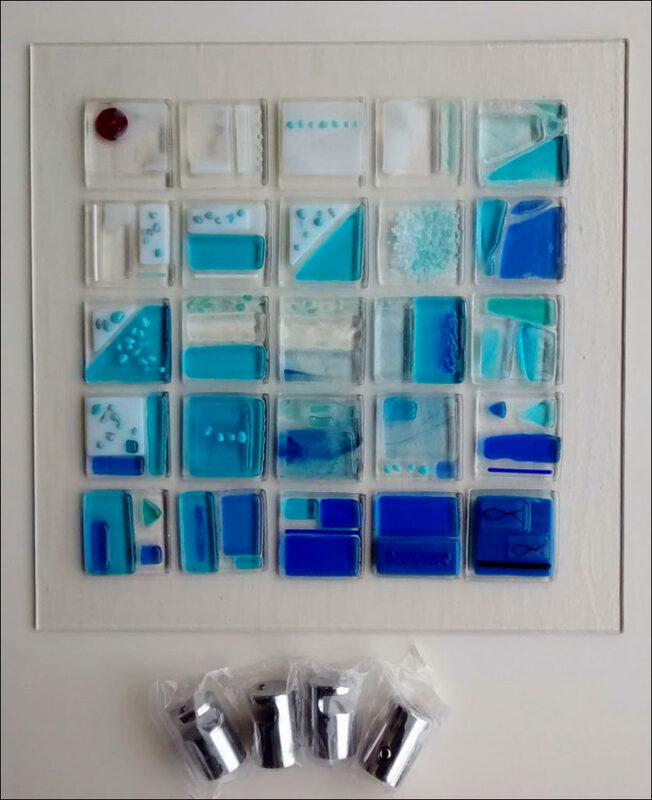 This one is ready to go on the wall – these fixings hold the glass and then fix it so it stands away from the wall. Clever, huh? 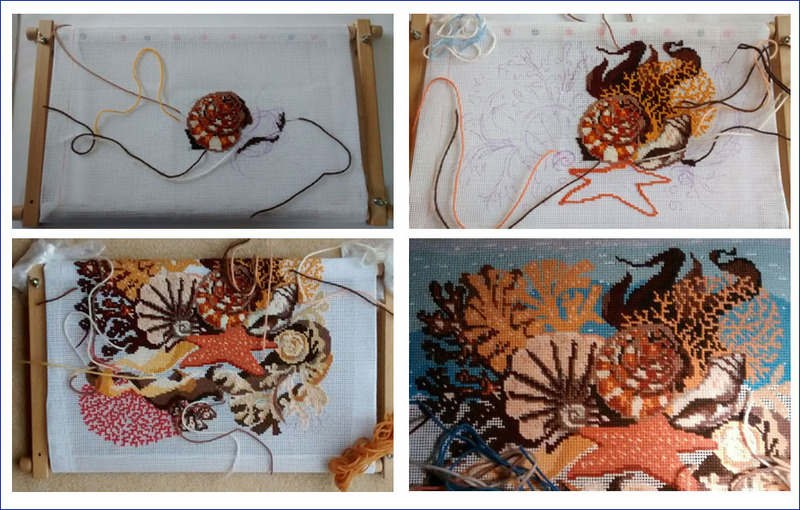 Meanwhile, the Winter evenings have been spent making this “seabed” tapestry, with odd bits of wools (plus a bit – it’s always the way – you think it’s thrifty, but rarely ends up that way!). 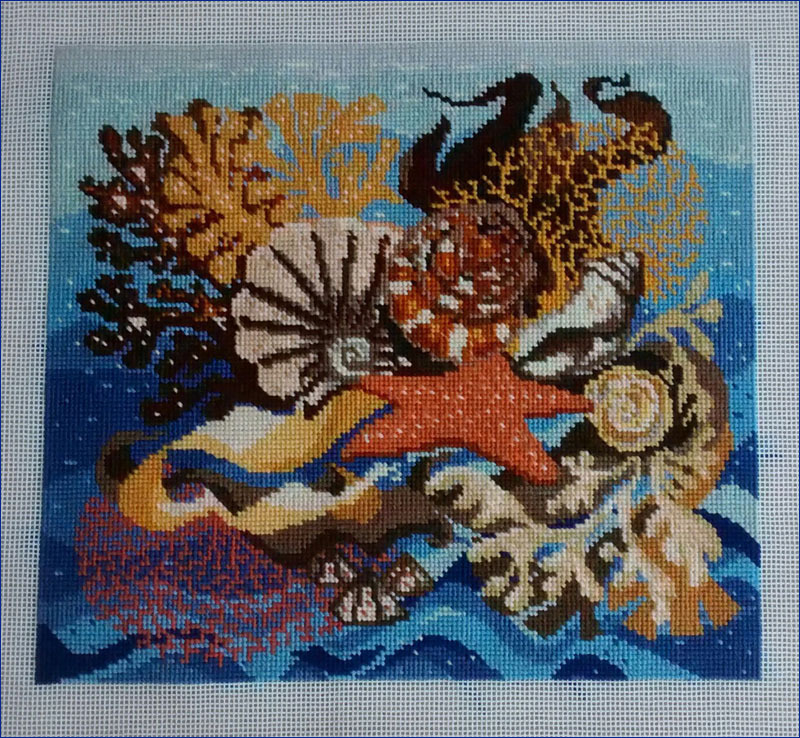 I made it up as I went along, which was more enjoyable than following a pattern, if a bit imperfect both in execution and finish. But it’s all mine! 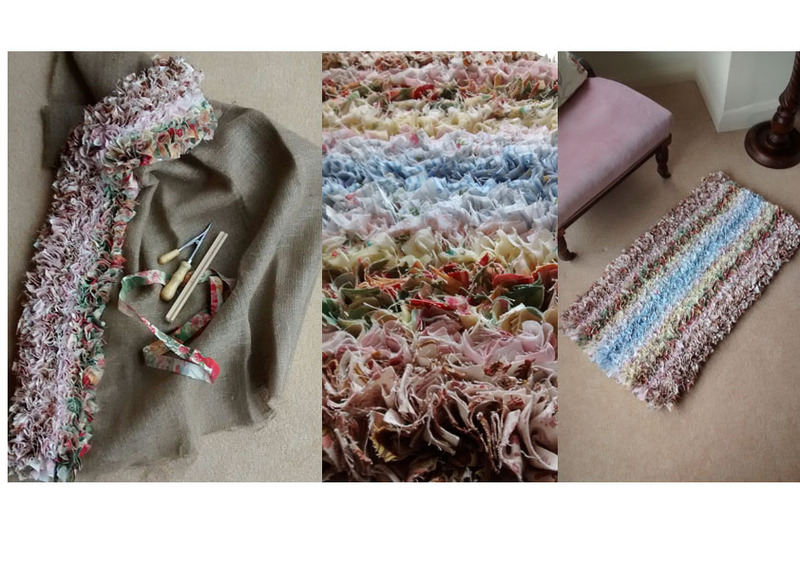 I then went on (while I was feeling everso thrifty), to a rag rug. It was the first whole rug I’d done. I won’t say it will be the last (there are a lot of old curtains I’ve insisted on carrying from loft to loft), but it was incredibly MESSY and HARD WORK. Geoff said I looked like I was wrestling with it. So I’m abandoning big cumbersome jobs in the evening in favour of something called slow stitching. Well, my version anyway. 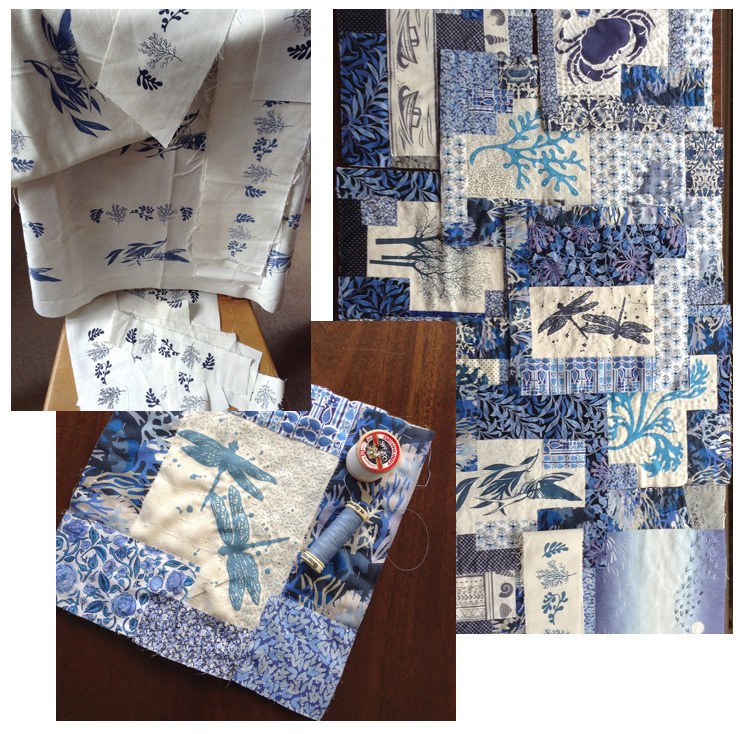 I’m making some pieces in a kind of Japanese Boro method, to eventually become (perhaps) a quilt. Or a jacket?! But NOT a cushion – we have enough! I didn’t seem to be able to think beyond “cushion” for ages. Maybe I’ll show a bit of it next blog. But it IS SLOW and a lot gentler!! Everything looks a bit washed out this month, but maybe I should try and think of it optimistically as PALE and INTERESTING. Yes, that would be a better attitude, and the colours are really subtle and gentle. Shame it’s so cold though! but I’ll get past it and move on in the next few weeks I expect. 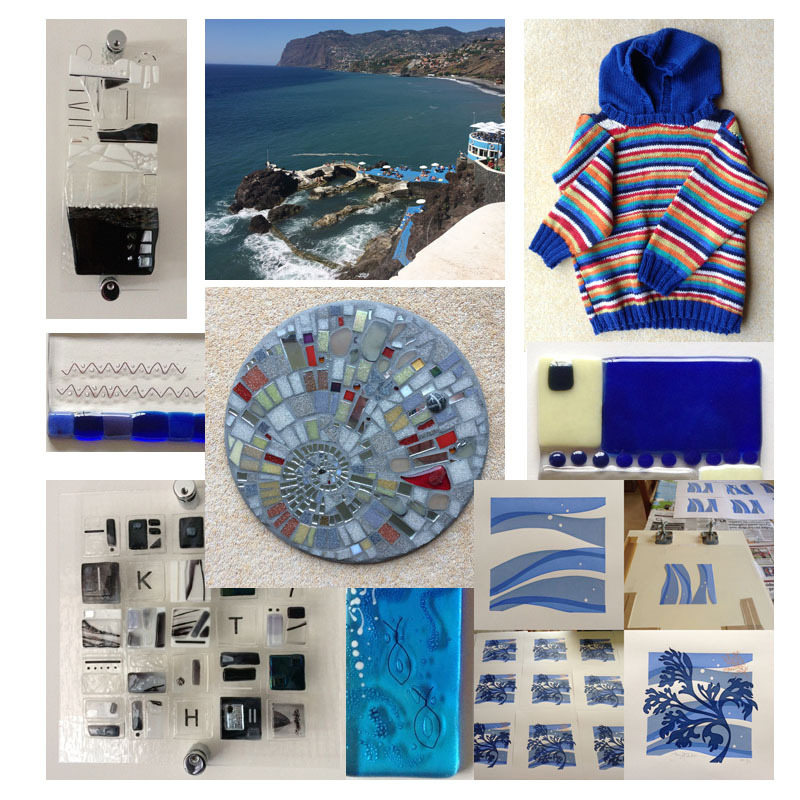 There are so many different ways of manipulating glass and colour to explore. 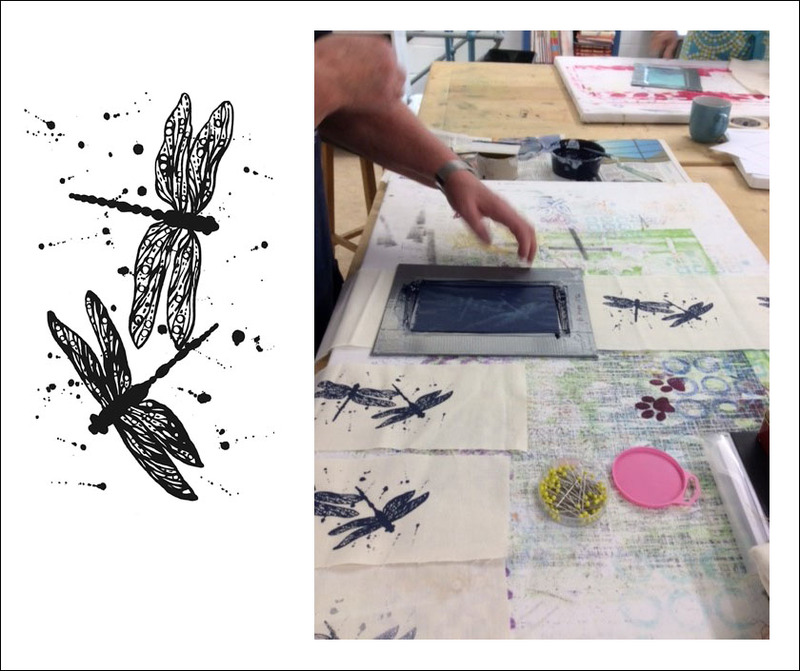 Back at silkscreening too, with the excellent team at Handprinted (www.handprinted.co.uk) on a course taught by Shirley Scott. I’m hoping that some of it will stick in my brain a bit better this time around! No shortage of plans and ideas for what to do – although my ambition usually outruns my skill. However, once I’m a bit more confident of working on my own, silk screening is something I think I might be able to handle and experiment with at the kitchen table. Speaking of which! 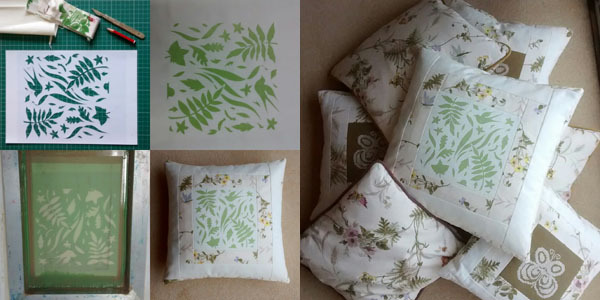 Friends and family will be pleased to note that I have now finished silkscreen panels for cushions and made enough for them to be a bit more comfortable around said table. Those wooden chairs are HARD! At home, I have been very, very busy having an early springclean. (Back to optimism!). I have been cleaning out plan chests and have found all manner of things from the past. It confirms what I have recently, and belatedly, learned. SKETCHBOOKS ARE A VERY GOOD THING. But a lot of drawings stuffed in those drawers, forgotten, abandoned, and some of it, I was even pleased to find! 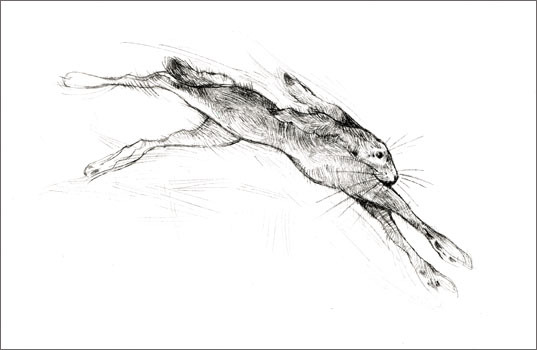 Even an etching which I am happier with now, than when I did it. 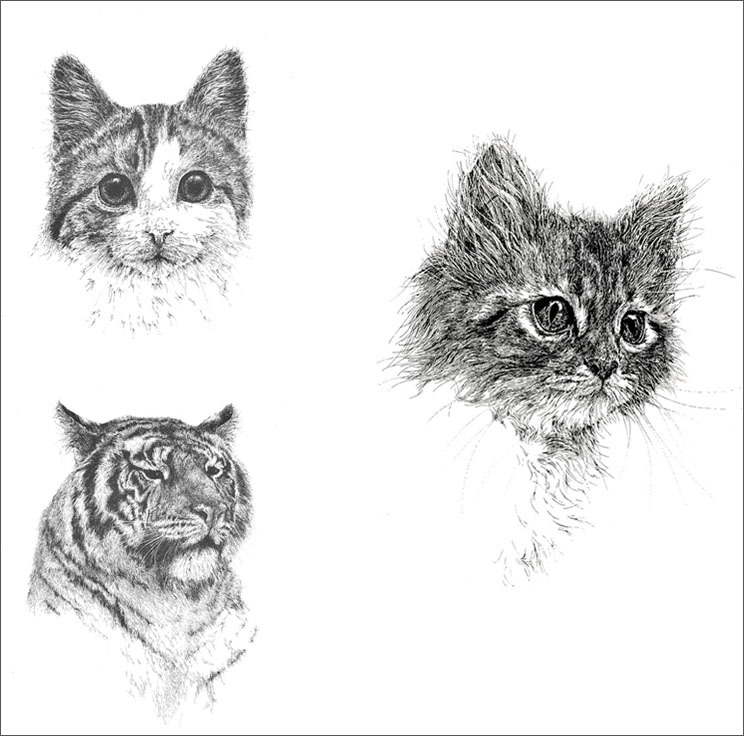 And some ink drawings of cats – done with a 0.2 Rotring, rather than a dip pen. Faster, but having to make adjustments to technique because of course there is no variation in line. 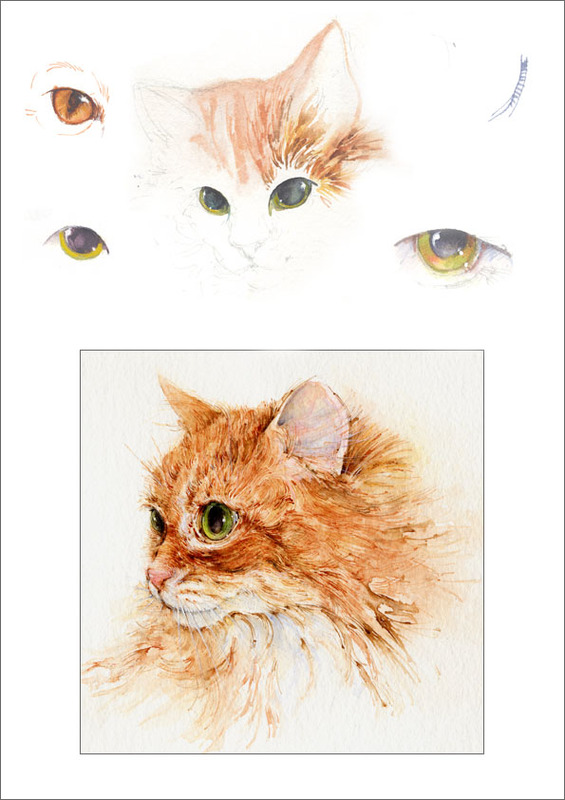 Having rediscovered it, I’m going to try to reproduce the kitten on right on a noil silk cushion – using silkscreen. Mmmm! Ambitious, and possibly not practical! (Also I may have more cushions in my life than really necessary – I don’t seem to be able to get beyond cushions sometimes). Also found lots of demonstration pieces from when I was teaching. This is a page of cats’ eyes, but there were loads and LOADS of watercolour flowers, collage and gold leaf. Must get back to that in the Spring. Also many, many “nearly” finished paintings. Some are now in the dustbin, but a few I’m not ready to abandon….yet. Cats’ eyes practice, and “Annie”, Kate’s cat. 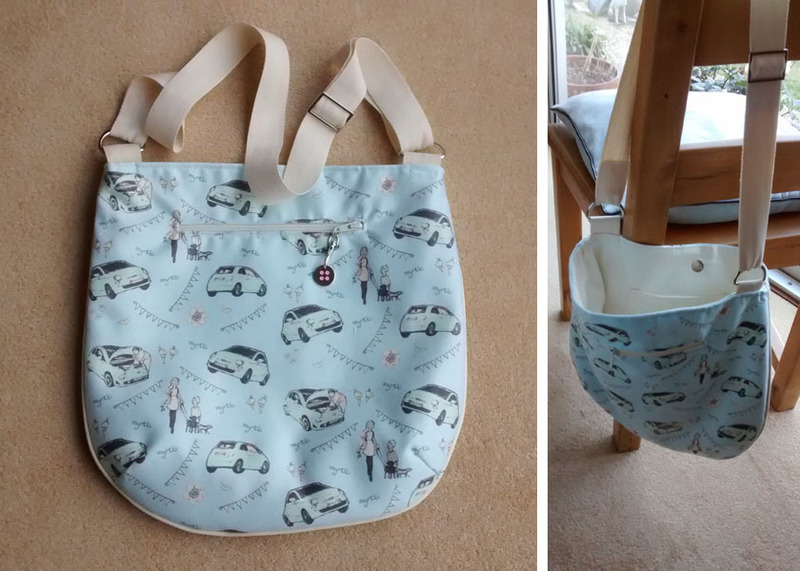 Just to continue a previous theme – I finished a bag to go with Kate’s Myrtle scarf – not without help I may add! For a simple thing, that pattern was sure complicated! 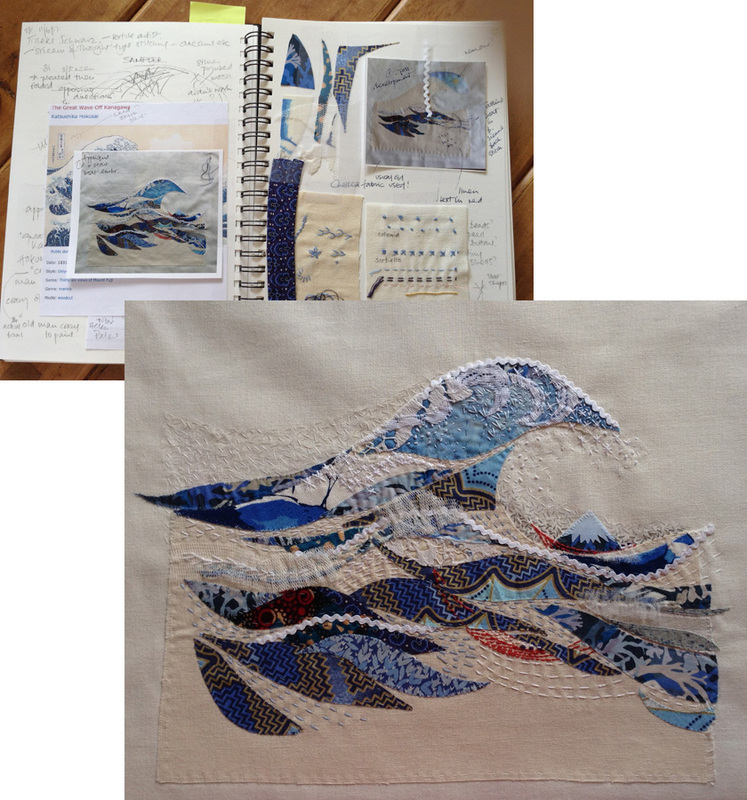 Thanks to The Eternal Maker in Chichester (www.eternnalmaker.com), for a really good workshop, it got done. Living in West Sussex is great. I’m not saying it would suit everyone, but really, there is so much going on, and it’s such a lovely place to be. 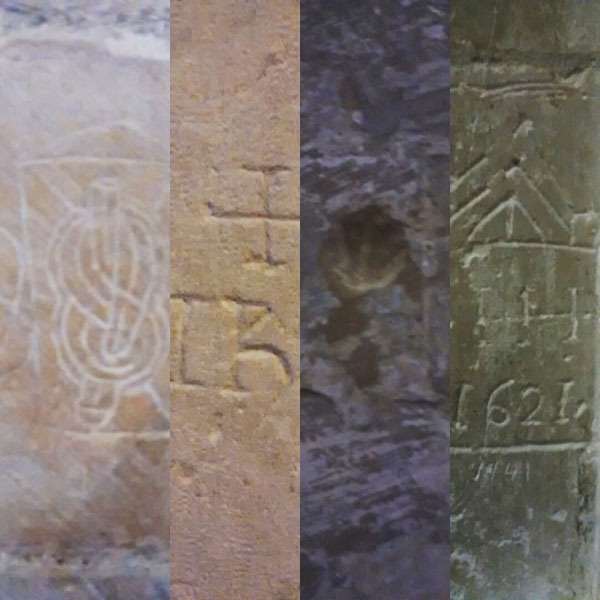 AND where else could I spend an interesting afternoon with a torch and friends in a cathedral looking for medieval graffiti? Eh?! Sorry if you try to use the link to websites – I haven’t got the hang of how to do it yet, and it may need another plugin – but at least the name is there. Apologies – I will manage it eventually! It’s customary to make some NEW resolutions every year, but really I haven’t got a very good record of keeping to them – so generally it’s never been a thing I cared to do – or share! 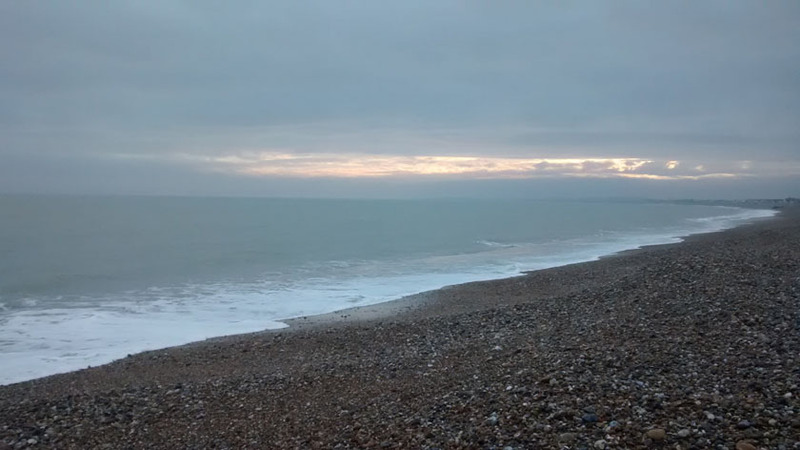 At the start of 2016 we had just moved house to Sussex by the Sea – and I had also left behind any intentions of doing any more big and exhausting Shows like Chelsea (I do miss it though). But hooray! I still exhibited at the SBA, the SFP and Florum, and fulfilled a RESOLUTION! After more years than I care to think about (but over 40 at least), I decided that I had sketchbook envy. I have always subscribed to the draw it on the back of an envelope and shove it in a bulldog clip with all the other passing thoughts. This of course, was a terribly disorganised habit and meant that a) I couldn’t find what I wanted, or b) I forgot all about the light bulb moment + brilliant idea. In fact, sometimes when the bulldog clip could take no more and all the bits of paper fell out, I realised I had had exactly the same flash of inspiration on several different occasions, each time thinking it was the first! Sad. 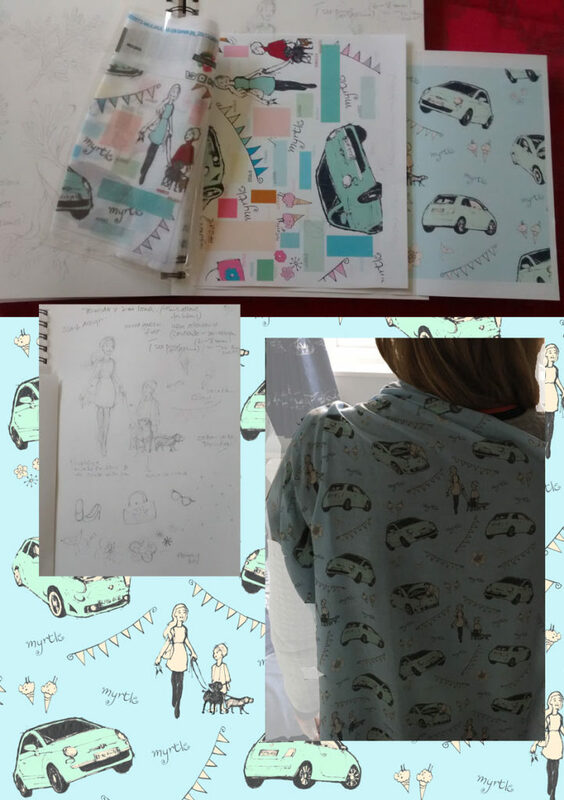 So last January I purchased a proper A4 sketchbook. It was cheap because I worry about expensive paper (post war habits), and didn’t want to feel extra intimidated. Who hasn’t hesitated with that first mark? 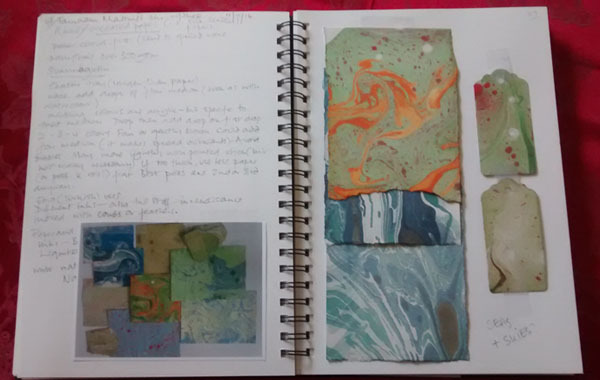 It is still a slightly unconventional sketchbook, because apart from drawings, it contains notes on all the different things I tried last year (see last blog), photographs of things in progress, things finished (satisfying! ), and things that may or may not come to something. I committed to the scheme, and can truthfully say, I’m hooked. Maybe years ago I was always in too much of a hurry – commercial art makes you behave like that. But now I really enjoy using a sketchbook. And if I do slip and use the odd envelope, I stick it in. So there we have it, I think that particular resolution is as good as several years worth all in one go to me. I feel really smug! And the only resolution I have made is to continue with the last one. (There are others I SHOULD make, but I know they’ll be wishful thinking).